Back to basics tip #28: I’ve had my new sewing machine for a few months now. It has been awesome. All of a sudden, I’m getting all sorts of ideas for sewing projects. Yesterday I pulled out my sewing machine’s manual and made a reference guide. I cut some scrap muslin, grabbed a Sharpie and started sewing. 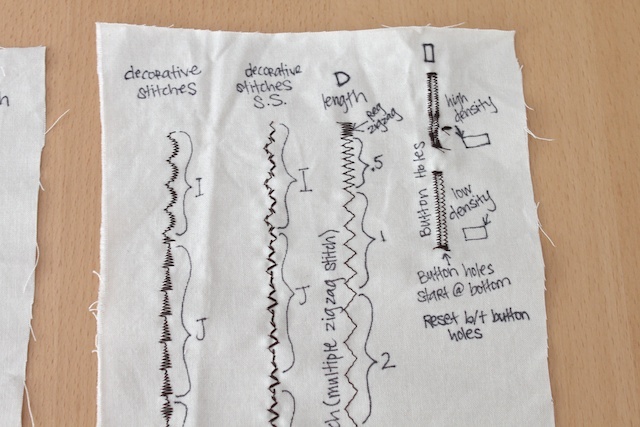 This is a reference guide for my sewing machine. It shows me the stitches in various lengths and widths. 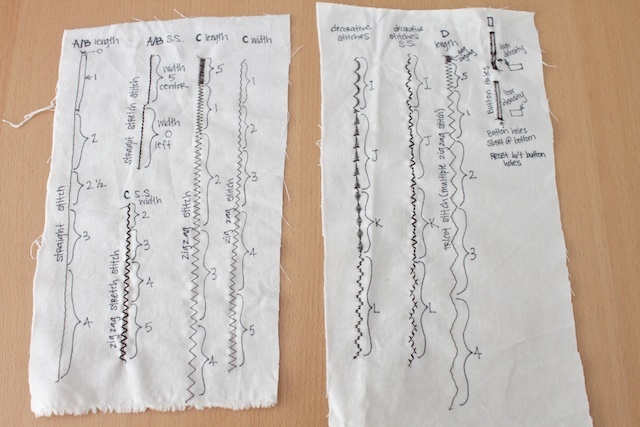 It will help me to remember what length and width to use for different projects. I also played around with some decorative stitches. Never know if I may end up using them one day. I also played around with my button hole settings so I know how to use it properly. This was a good get-to-know-you exercise to help me understand the manual and learn some of the features and functions of my machine. I keep the sewing stitches reference guide in my notions box so I can use it often. I have been working a several sewing projects and I can’t wait to show you some of them. And as I have been sewing, I have also been using this reference guide. It’s so handy to have around. P.S. 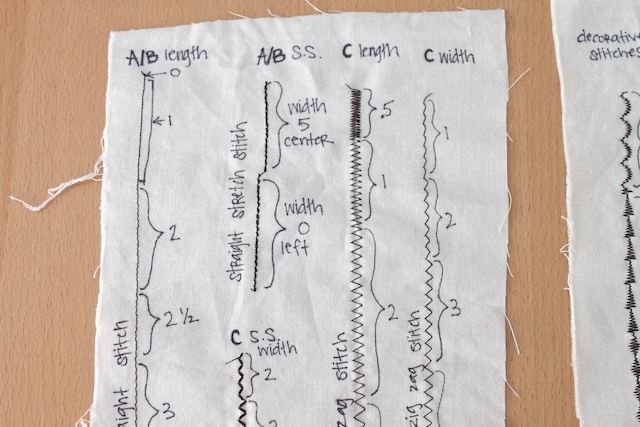 For other tips and basics of sewing, check out the Sewing 101 series. » Tell me… Have you read your sewing machine manual yet? Genius!!! i am always doing test patches on scrap fabric. i am definitely doing this!!! Great idea!!! I bought my machine about 4 years ago and I have yet to read the manual in full. When I need to know something I look for that one thing and then I’m done. But I love this idea I may do this as well. I am going to do the same with machine….it is several years old already, but I forget what is what when I pull it out! thanks for the idea! Haha! I have to read the manual every time I sew, and practice on a scrap before I start a new stitch. This is genius! Great idea. I have a similar utility, but not so perfectly executed. This is a great idea and one we should all do when we buy a new machine. These types of ‘notes’ can save lots of time when a new project is at hand. thx.